SENDING YOU A VERY BIG THANK YOU! To everyone who supported my recent project collecting tampons and pads for Gold Coast women experiencing homelessness, together we collected over 5000 items! 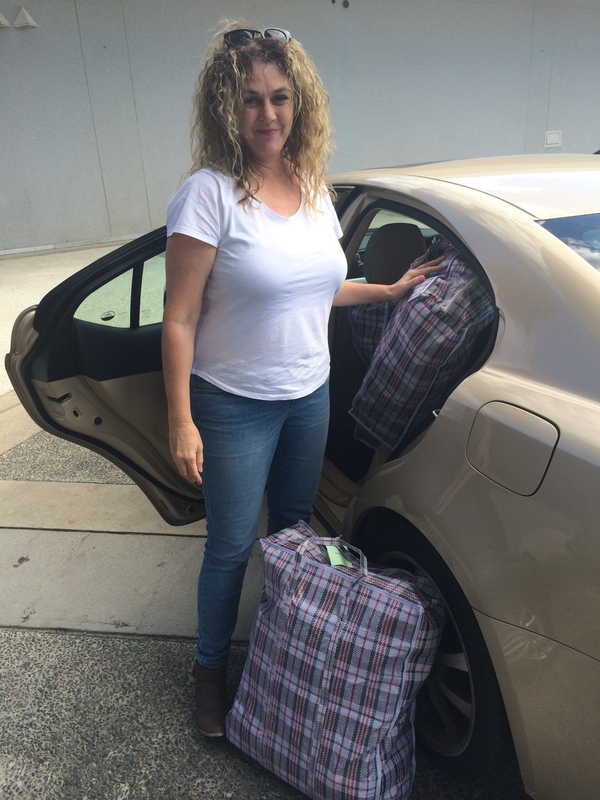 Here is a picture of Jayne, from Gold Coast Secret Women’s Business loading her car with THREE Hong Kong shopping bags filled to the brim with goodies. Thank you SO much for your part in this. I am constantly blown away by your kindness, generosity, and the amazing things we can achieve together – thank you for responding to this call for help! I would like to share this lovely letter of thanks I received this week, from the wonderful ladies behind Gold Coast Secret Women’s Business – see below. Many donations came in anonymously, so please pass my heartfelt thanks and this email onto anyone else you know contributed to this project. It is not too late to get involved – check out my earlier blog post with a list of organisations Australia-wide who help women in this critical way – The Melbourne Period Project why not start an ongoing collection at your work helping your local project? This entry was posted in Causes, Community, GIVING, KINDNESS, Pay it forward, Uncategorized and tagged Charityspam, donate pads tampons, Gold Coast Secret Women's Business, help women, Tampons for homeless women, Tara Castle, The Melbourne Period Project, women helping women. Bookmark the permalink.